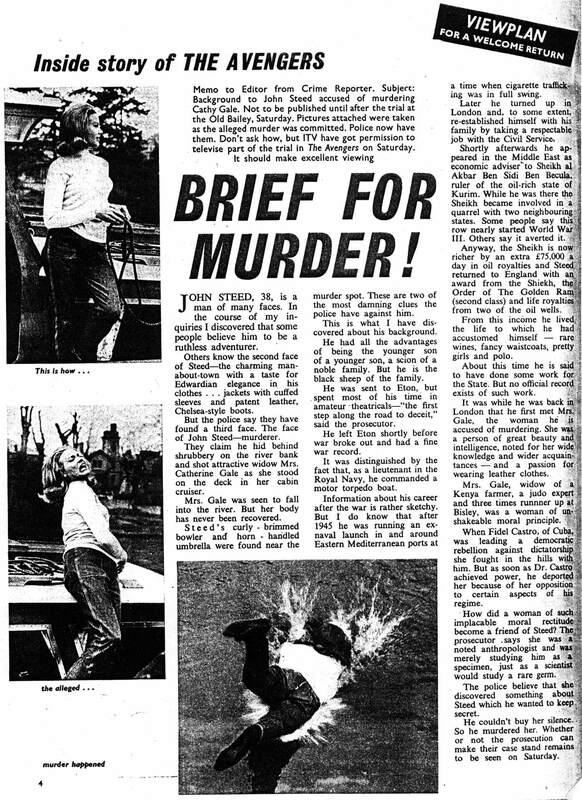 The Avengers - TV Times - September 20 1963 - Brief For Murder! JOHN STEED, 38, is a man of many faces. In the course of my inquiries I discovered that some people believe him to be a ruthless adventurer. Others know the second face of Steed - the charming man-about-town with a taste for Edwardian elegance in his clothes... jackets with cuffed sleeves and patent leather, Chelsea-style boots. But the police say they have found a third face. The face of John Steed - murderer. They claim he hid behind shrubbery on the river bank and shot attractive widow Mrs. Catherine Gale as she stood on the deck in her cabin cruiser. Mrs. Gale was seen to fall into the river. But her body has never been recovered. Steed's curly-brimmed bowler and horn-handled umbrella were found near the murder spot. These are two of the most damning clues the police have against him. This is what I have discovered about his background. He had all the advantages of being the younger son of a younger son, a scion of a noble family. But he is the black sheep of the family. He was sent to Eton, but spent most of his time in amateur theatricals - "the first step along the road to deceit," said the prosecutor. He left Eton shortly before war broke out and had a fine war record. It was distinguished by the fact that, as a lieutenant in the Royal Navy, he commanded a motor torpedo boat. Information about his career after the war is rather sketchy. But I do know that after 1945 he was running an ex-naval launch in and around Eastern Mediterranean ports at a time when cigarette trafficking was in full swing. Later he turned up in London and, to some extent, re-established himself with his family by taking a respectable job with the Civil Service. Shortly afterwards he appeared in the Middle East as economic adviser to Sheikh al Akbar Ben Sidi Ben Becula, ruler of the oil-rich state of Kurim. While he was there the Sheikh became involved in a quarrel with two neighbouring states. Some people say this row nearly started World War III. Others say it averted it. Anyway, the Sheikh is now richer by an extra £75,000 a day in oil royalties and Steed returned to England with an award from the Sheikh, the Order of The Golden Ram (second class) and life royalties from two of the oil wells. From this income he lived the life to which he had accustomed himself - rare wines, fancy waistcoats, pretty girls and polo. About this time he is said to have done some work for the State. But no official record exists of such work. It was while he was back in London that he first met Mrs. Gale, the woman he is accused of murdering. She was a person of great beauty and intelligence, noted for her wide knowledge and wider acquaintances - and a passion for wearing leather clothes. Mrs. Gale, widow of a Kenya farmer, a judo expert and three times runner up at Bisley, was a woman of unshakeable moral principle. When Fidel Castro, of Cuba, was leading a democratic rebellion against dictatorship she fought in the hills with him. But as soon as Dr. Castro achieved power, he deported her because of her opposition to certain aspects of his regime. How did a woman of such implacable moral rectitude become a friend of Steed? The prosecutor says she was a noted anthropologist and was merely studying him as a specimen, just as a scientist would study a rare germ. The police believe that she discovered something about Steed which he wanted to keep secret. He couldn't buy her silence. So he murdered her. Whether or not the prosecution can make their case stand remains to be seen on Saturday. From: The TV Times, England, September 20th 1963.